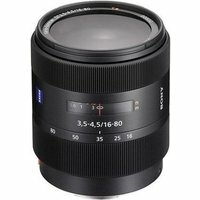 The Sony 16-80mm f3.5-4.5 is the ultimate all-in-one zoom lens designed specifically for DSLR imaging. It's the first professional-grade 5X zoom lens specifically designed for APS-size CCD image sensors -- providing incredible precision in a single compact, easy-to-carry lens that carries you from 24mm wide-angle to 120mm telephoto (35mm equivalent). Advanced Carl Zeiss® optical design and anti-flare T* Coating make this one of the most valued lenses in the world of digital photography.